March 31, 2011  The Major League Baseball season gets underway Thursday. Major League Baseball moved Opening Day up to avoid playing World Series games in November. March 28, 2011  Rebel fighters in Libya are making their way west after taking back several cities along the coast toward the capital Tripoli. And they've taken key oil terminals along the coast. After a week of NATO air strikes, the rebels are claiming success in Sirte, which is Moammar Gaddafi's hometown. March 21, 2011  The U.S. and its allies have carried out a second night of air strikes in Libya, while Moammar Gadhafi vowed to fight a "long war." A new sense of optimism has swept over eastern Libya — an area still held by rebel forces. Those rebels were on the verge of being routed by government troops before a U.N. vote last week made Libyan air space a no-fly zone. March 21, 2011  A cruise missile destroyed a building in Moammar Gadhafi's residential compound in Tripoli Sunday night. And rebel fighters report air strikes on Gadhafi's forces in eastern Libya on Monday. The U.S. and other governments behind the attacks say the goal is to protect Libyan civilians and force Gadhafi to back off from his attacks. March 18, 2011  Men don't have the market cornered for excitement in college basketball. Women's NCAA play begins Saturday. The University of Connecticut has been the champions for the last two years. March 18, 2011  The UN Security Council voted Thursday to impose a no-fly zone over Libya and "take all necessary measures" to protect civilians. The vote came as forces loyal to Moammar Gadhafi were closing in on the rebel stronghold of Benghazi. March 16, 2011  In Japan, thousands have been evacuated from their homes near the crippled nuclear plant, and thousands more lost their homes in last week's earthquake and tsunami. March 16, 2011  In Bahrain, military troops and security forces moved against thousands of anti-government protesters occupying a landmark square in the capital. A day before, the king imposed emergency rule in the violence-wracked Gulf kingdom. March 15, 2011  Saudi Arabia and other Gulf nations sent forces to Bahrain after a request from Bahrain's royal family. Protesters have been demonstrating for more than a month against the island nation's government. March 15, 2011  The problems at the nuclear power plant in Fukushima, Japan, are growing more ominous. There was a third explosion and a fire. High levels of radiation have been detected. March 14, 2011  The second hydrogen explosion in three days rocked a stricken Japanese nuclear plant Monday, sending a massive cloud of smoke into the air and injuring workers. 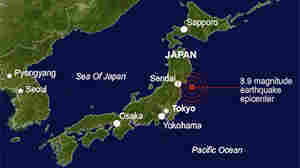 March 11, 2011  Japan's northeastern coast was slammed by a strong earthquake and tsunami Friday. It appears most of the damage was caused not by the ground-shaking but by the tsunami it generated. The tsunami is now sweeping across the Pacific Ocean. March 11, 2011  President Obama had a busy week dealing with two conflicts. The fighting in Libya is continuing with no end in sight. On Friday, the president will hold a press conference where he's sure to be asked about Libya. Domestically, Democrats and Republicans are no closer to ending the budget impasse that threatens to shut down the government by next Friday. March 11, 2011  In Saudi Arabia, protests are expected against the government after Friday prayers. The Saudi government has banned all kinds of public demonstrations. The scale of Friday's demonstrations, as well as the government's response, will be closely watched.